Aun and S. are a husband and wife team who run a happy little blog called Chubby Hubby (see the links section) which has become my new favourite place on the web, with recipes, fantastic tips for food photography and lots of interesting observations about the restaurant business from an international perspective, discussions on design and essays on marriage and travel. I am, quite frankly, addicted to it. 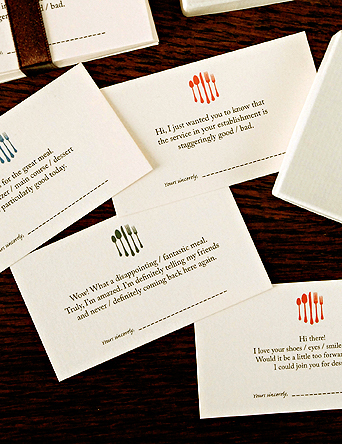 One of the little gems I discovered on the site were these glorious restaurant feedback cards, which the couple had given to their friends as Christmas gifts as a means of (potentially) enhancing the restaurant-going experience. The intention was to create a tongue-in-cheek gift for friends with a good sense of humour. And, of course, we left a line for our friends to fill in their names because if you feel the need to leave a comment, you should always have the courage to take ownership of your opinion. Each box has 80 cards, 20 of each design. Labels were also made for the tops and bottoms of the boxes. 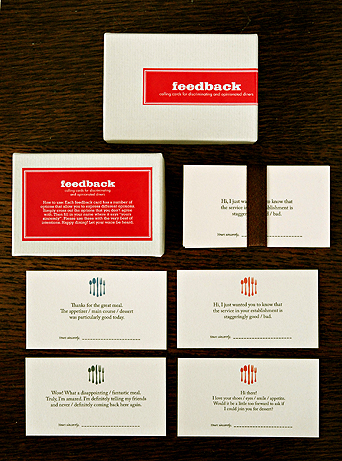 It was really, really fun designing these and we’ve been happy with the response from friends.